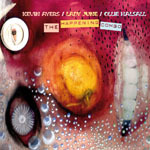 Share the post "Album review: KEVIN AYERS/LADY JUNE/OLLIE HALSALL – The Happening Combo"
The news handout with this cites it quite correctly as being ‘something of a curio’. It’s not that the music involved is overly outré but that the package overall corrals up three very distinct talents whose music here is seemingly disparate. Tracks (three from each) veer from home recordings of strummed pop songs, to eerie spoken-word nonsense poems, to quasi-metal rock-outs. Oddly, while the tone poems of Lady June synch with her period albums, ‘Linguistic Leprosy’ and ‘Hit & Myth’, guitar virtuoso and ex-Patto axe-man, Ollie Halsall is down for the gentle pop songs, while prog’s odd-ditty merchant Kevin Ayers is in full-on ‘rawk’ mode for his contributions. Does this matter? Not a jot: the result is a very enjoyable wander though the individual and collective mind-set of these ex-pat, colonial talents as they co-existed in the mountain town of Deia in Majorca, Spain during the 1980s and ‘90s. Halsall’s songs are acoustic numbers, probably recorded on the balcony or dining room; June’s (outtakes and ‘refreshed’ tracks from her archive) are more studio-bound, while Ayers’s capture him upbeat in a New York City studio with a top-notch line-up, including Halsall, blister their way through three then-new songs, including an affecting cover of Dylan’s “Lay, Lady, Lay”, that didn’t the get major label pick up expected, sending the disappointed crew back to the Balearics. Digi-packaging scores well here: Ayers’ fan club honcho Martin Wakeling and curator Marvin Siau (who also contributes his original version of Ayer’s ‘Falling Up’ album’s “Another Rolling Stone”) both write from positions of first-hand knowledgeability when it comes to contextualising this music as the sound-track to agreeable days of wine, fish and smoke, couched in hazy, hot Mediterranean afternoons, to a backdrop of cicadas. Beguiling period photography plus more of June’s extraordinary artwork add further to establishing a storyline of three eccentric individualists on the run from the past. This beggars further investigation – watch out for the documentary! This entry was posted in ALBUM REVIEWS, ALBUM REVIEWS (Mobile), All Posts and tagged album, Kevin Ayers, Lady June, Ollie Halsall, Patto, prog, progressive, psychedelic, review, rock, Soft Machine, The Happening Combo. Bookmark the permalink.